Ashley J George | AD-ventures of a Creative: Two Paddles. One Ball. Phoenix is hosting the R&R "Two Paddles. One Ball." Ping-Pong Tournament starting Friday, March 28th. This 32 person tournament is a single elimination battle to the death (insert echo here). We will be live streaming throughout the tournament. 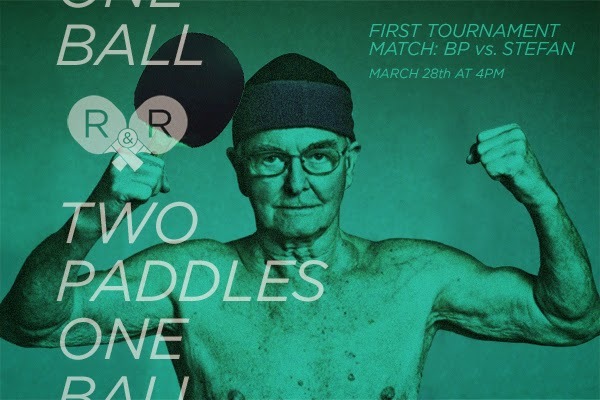 The quarter, semi and final rounds will have scheduled times and dates so anyone can tune in and watch the action here: http://rrpartners2.com/rr/pingpong/. We will also be live tweeting and instagramming at #RRpong. Who is ready to get paddled?